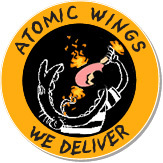 Atomic Wings provides authentic Buffalo wings, prepared as they were invented in 1964 in Buffalo. The result is unforgettably good eating. Bar Coastal: 1495 First Ave. (E. 78th St.) New York, NY. (212) 288-6635. Porterhouse: 169 Mamaroneck Ave. White Plains, NY. (914) 831-5663.